Scientist Seth Brundle has just developed a matter transporter, but when he tests it on himself, a fly gets in the transport chamber with him, causing their genes to unintentionally splice in the process. Just recently, we watched and reviewed Kurt Neumann's 1958 horror classic "The Fly," which was more of a slow-paced drama with a little horror thrown in to keep it interesting. We decided to watch David Cronenberg's 1986 version of "The Fly" for comparison's sake. It just goes to shows all remakes aren't inherently a bad idea. Much like the original, this is a film about a scientist who is working on developing a matter transporter. Once he tests it on himself, his genes get spliced with the genes of a fly when it sneaks into the transporter with him. The major difference is, in the more modern version, the scientist becomes a single, slowly evolving hybrid version of the two creatures instead of two separate ones. This remake stars Jeff Goldblum as Seth Brundle, the aforementioned scientist attempting to perfect matter transportation. Joining him is Geena Davis as Veronica Quaife, a reporter for a tech magazine who is trying to get a scoop on the story of Seth's discovery, but winds up falling in love in the process. The final major player in the film is Jon Getz as Stathis Borans, Veronica's editor and former lover who becomes a point of contention throughout the movie. We're not always fans of remakes, but in some cases, they actually wind up being an improvement on an old story or concept. Such is the case with Cronenberg's "The Fly." He has taken a classic story and truly made it his own bizarre, disgusting, engaging and entertaining story. Jeff Goldblum is the perfect casting choice as the rambling, somewhat hyperactive scientist Seth Brundle. Goldblum would go on to play similar roles many more times throughout his career, but this is one of his best performances. Geena Davis does a great job as a driven reporter who is put in an extremely worrisome situation later in the film, which leads to a very unnerving visual moment. Speaking of unnerving moments, you can't talk about "The Fly" without talking about the insane visuals. They are brought to life by some impressive makeup work and tremendous creature effects by Chris Walas and Stephen Dupuis. Their work on the fly creature is astounding and utterly disturbing. These visually unsettling images help make the film the success that it is, and they took home a much deserved Acadamy Award for their efforts. These aspects still hold up extremely well today. 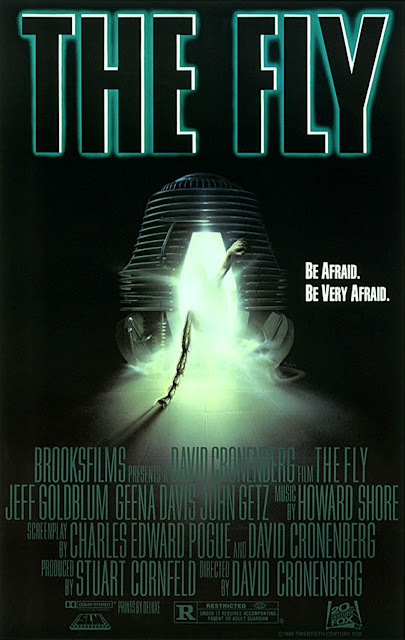 Though the story of "The Fly" is a fairly simple and effective horror story, it also deals with personal identity and explains a tale of one man's Icarus Syndrome. It demonstrates our desire to fly but shows how someone flying too high too quickly without taking proper precautions will cause them to get burned. David Cronenberg is known for making weird and unnerving films, and "The Fly" is certainly one of his best and one of our favorites. We love Jeff Goldblum and Geena Davis here, and when all of these aspects are combined with its incredible visuals, you've got one hell of a horror for the ages.